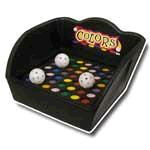 Toss the three balls to try and get three of one color to be a winner! Game can be set on a table or may be used as a stand-alone game with the provided legs. * Please call us for any questions on our color toss tabletop rentals in Pipersville PA, Hatfield PA, and Bucks & Montgomery Counties in Pennsylvania.